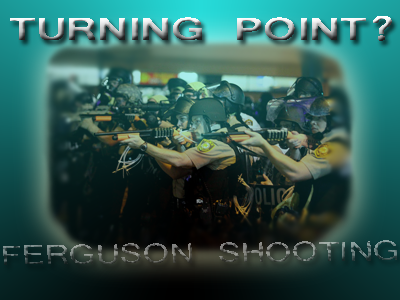 Only time will tell, but is it to soon to guess whether the Ferguson Missouri shooting of unarmed teenager Michael Brown mark a turning point in our march toward tyranny in America? There are signs that this could be the case. Yes this could be an overly optimistic assumption about the current direction of the police state in America, but there is a slight chance that the consciousness that came with the Ferguson shooting may have been a badly need temporary cure to the metastasizing police state problem. Before anyone makes assumptions of how naive I'm being or overly optimistic, let's clarify. We are in a battle of competing paradigms and competing consciousness. One important thing to note about the police state is that authority, control, intimidation and police state madness is itself a real-time live form of consciousness. In this police state consciousness we can confirm the typical officer becomes consumed in their role. This disconnected behavior had been confirmed in previous psychology experiments and we know how governments carefully train police to do as they are told. Add to that, the influence of the culture of police and what we see is a group of people acting within their own (twisted) consciousness to oppress others without consequences. We saw this in Nazi Germany and many other examples throughout history. This powerful competing consciousness, the police consciousness, took a step back after the Ferguson shooting. How do we know? Some indicators are alternative and social media's coverage of the images and sounds of the Ferguson police state brutality on American protestors. This mass media coverage of the police state forced mainstream media to pay attention to the police state brutality. Together, this brought an even greater mass awareness of police brutality in America that the control system wasn't prepared for. The result? a. In San Antonio police launched a new program called 'I Pledge to do the Right Thing' campaign. b. In Ferguson a cop was actually suspended for illegally pointing a rifle at innocent protestors and threatening to kill one. c. In Davis California the city council just ordered police to get rid of their military MRAP vehicle given to them for free by the federal government. d. St. Louis police officer (and Glendale police officer) suspended for violent hate talk. e. The (same) cop who threatened to kill a reporter in Ferguson officially resigns. Does this mean that the police state problem is finally being addressed? Some optimists may see it this way but it is far too soon to celebrate any long term victories. At least this shows that the media is willing to give attention to this issue and that officers and police departments nationwide have been served with a dose of consciousness. This consciousness of deliberately spewing hate, needs to be exposed and this idea that police have the right to do whatever they want has to be contained and perhaps the Ferguson shooting has contributed to this. On the optimistic side of things it is possible that this attention brought to the violent out-of-control police state could be a starting point to limiting the equipment the local police receive from federal government. Yes, the Obama administration has stated concerns about this issue but this is inconsistent with what we know about federal government's role in all of this. Perhaps this incident however, will eventually force local communities to end their participation in the controversial 1033 program enacted in 1994 which made it possible for the Pentagon to dump military equipment on local police nationwide. Perhaps we are finally reaching the initial point of critical reasoning that will allow us to debunk the argument that police needs military gear to be "safe". On the pessimistic side of things however, perhaps these events will be used to engineer a new justification for brutal police force and militarization down the road. That is, perhaps we are being set up for a new series of false flags which will be designed to once again justify why police needs military equipment. Perhaps they will stage a massacre involving police deaths (note to police!) and then make the argument that if they had assess to military equipment none of this would have happened. Unfortunately, all victories must be taken with a grain of salt. For now, we can't live in a world overly-anticipating the new world order's next move. We have to take our lessons from the real time events and find ways of improving our experience. Those of us alive today have the power to use the Michael Brown murder in a positive way and take note of the things that went wrong. Let's remember Jake Tapper and CNN staging scaremongering political signs behind the crowd to twist Ferguson into ISIS scaring and warmongering. Let's remember the mainstream media desperately trying to spin the shooting into a race issue. Let's remember the psycho cop who threatened reporters with death if they didn't listen to him. Let's note the staged violence and the militarized presence of police treating peaceful American protestors as terrorists. Let us remember the images and sounds of a gun firing eleven times in a matter of seconds on an unarmed teenager. Let us remember the dead body thrown into an SUV as if it were a dead dog or road kill. Everyone has their own memory of this incredible event as this event does carry the potential to be a game changer in the police state madness that gripped the United States since the Occupy revolution of 2011. We all saw how the U.C. Davis officer who sprayed innocent peaceful student activists with pepper spray was demonized then later financially rewarded. Let us not allow these corrupt cops to be rewarded again. We all know that the shooter, officer Darren Wilson has been unusually quiet, out of sight and given protection by his police constituents from the general public and media. We know that he has been preparing his defense using mystery voices and sporadic spot supporters all spinning the narrative into one that paints Wilson as the victim instead of the aggressor. Let us not allow this narrative to open the door to injustice. Wilson supporters would sell you a narrative and philosophy that states that if Wilson felt in any danger or felt attacked, then he has the right to empty out his gun on an unarmed teenager, and that is not what policing is all about. That is not what living in America is all about. Officers are equipped with radios, cameras, batons, tasers and mace to record, disable and potentially capture someone they want to question. Shooting someone to death execution style with eleven shots, six of which actually landed on the body is an execution any way you look at it, not a defensive action. Hopefully the police defense argument, which holds the power to potentially divide America further, will be allowed to prove its case soundly. Hopefully, this story will culminate with reasonable justice based on the facts. Either way, we can expect the control system and its eager mainstream media mouthpiece to use the final verdict to create division amongst Americans. This should remind us that the end game is to destroy America, kill freedom, strengthen the police state and bring tyranny to America. Let us use the circumstances we have now to turn this police state agenda in a different direction. This story has proven that we-the-people and the alternative media have the power to do just this. We have the power to share information and expose the new world order and its corrupt police state. Let us keep doing what we are doing and hope for the best. With events happening so fast, let us appreciate and focus on the bigger picture. As these events happen, practice thinking on your own. We saw a lot of independent thinking in Ferguson and that was one of the great things. We saw and heard from people who are sick and tired of the police state brutality and the mainstream media coverage of it. Let's keep this theme going moving forward, for in this type of thinking is how we will find the answers and the solutions that we are looking for. Like the Bundy Ranch confrontation involving patriots willing to die for freedom and the Constitution, the Ferguson shooting ("hands up don't shoot") confrontation showed the power that peaceful demonstrations can have on the psyche of the police state. In the end, hopefully the Ferguson shooting will be talked about years from now as a key point in the awareness of the police state and hopefully the path that it leads to will be one that many of us will be proud to look back on.